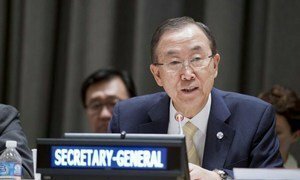 A statement issued by Mr. Ban's spokesperson said the UN chief is particularly concerned by the reported use of heavy weapons and by the large numbers of casualties, including among the civilian population. “The Secretary-General urges all relevant parties to put an immediate end to the fighting, fully respect the ceasefire agreement and take urgent steps to de-escalate the situation,” said the statement. United Nations Secretary-General Ban Ki-moon today voiced his opposition to the renewed fighting over the disputed Nagorno-Karabakh region in the South Caucasus, urging the Armenian and Azerbaijani sides to respect a ceasefire agreement.